The vital connection between killer whales, salmon, and dams. NOAA listed the Southern Residents as endangered in 2005 when there were 88 orcas in the wild. Now, more than a decade later, there are 82. Two more have died this year. A number of others are thin. One is emaciated and appears to have stopped nursing her calf. 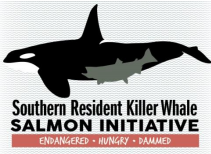 Per the NOAA 2008 recovery plan, the SRKW population must increase by an average 2.3 percent per year for 28 years to be removed from the Endangered Species list. NMFS (2008) Recovery Plan for Southern Resident Killer Whales (Orcinus orca), p. v. The population continues to decline. Approximately 80% of these endangered orcas’ diet is Chinook salmon.  The Southern Residents live, die and reproduce based on Chinook salmon abundance. The births of eight surviving orca calves between December 2014 and January 2016 coincided with larger Snake River hatchery fall Chinook salmon runs that occurred in 2013 through 2015, in association with a hatchery research project that greatly inflated the runs. Although the research project has ended, it provides good evidence that when there are plentiful Snake River Chinook, the endangered orcas can conceive, reproduce, survive and recover. Due to their high fat content and high nutritional value, Spring/summer Chinook may be crucially important to endangered orcas. 2. Prey samples collected by NOAA show Southern Residents eat Columbia and Snake River Chinook. Salmon are not recovering despite the approximately $800 million spent on Snake River fish passage improvement structures. These improvements were expected to lead to Snake River salmon recovery. They haven’t. The money spent on structural improvements to the four lower Snake River dams is roughly five times more than estimated in the federal government’s 2002 $33 million study. Survival of wild salmon and steelhead runs requires a minimum 2% smolt-to-adult survival rate (SAR). Recovery of Snake River salmon and steelhead requires a 4%-6% SAR. The overall SARs for Snake River populations of salmon and steelhead are not meeting this goal.1 The SAR for wild Chinook salmon over the past 18 years has averaged .59%. This is not recovery. In 2013 NOAA Fisheries acknowledged that Snake River spring/summer Chinook and steelhead runs are not increasing, but instead have been “relatively stable since 1999 with the exception of lower estimates in 2001 and 2004.” In addition, the runs were lower in 2013, 2014, and 2015 due to hotter water and lower flow. In 2015 the Snake River became a killing field for the larger than average sockeye runs that were returning to spawn. Due to drought, climate change and the four dams, superheated water temperatures killed 90% of the returning sockeye. The Four Lower Snake River Dams Are the Problem. The dams have been killing upwards of a million salmon and steelhead annually for 40 years. The dams impede or block the migration of lower Snake River salmon and steelhead. The fish must get by eight major dams on their way out to the ocean to mature, then again pass the eight dams to return as adults to where they were born to spawn. Snake River fall Chinook historically spawned in the main stem of the river. The dams have inundated and directly destroyed this habitat for spawning. By impeding and blocking migration to and from the ocean, Snake River dams and their slack water reservoirs are deadly to salmon and steelhead. 1. Slack water reservoirs slow juvenile fish migration to the ocean. 2. Slack water reservoirs cause water temperatures to rise to lethal levels for salmon and steelhead. The four Snake River dams can add 6 to 12 degrees Fahrenheit to water temperatures. The high water temperatures caused by drought, climate change and dams have been catastrophic to migrating fish in 2015. 3. The reservoirs are ideal for warm water predators that have inundated the reservoirs and voraciously feed on juvenile salmon and steelhead. 4. The reservoirs increase disease both by degrading the water quality and increasing its temperature. 5. Slack water reservoirs interfere with juvenile navigation and physical development. Hatcheries are not able to compensate for dam impacts to wild salmon. Instead, in rearing areas, the release of larger hatchery juvenile salmon overwhelms wild juveniles, while returning adult hatchery fish dilute wild salmon genetics to the point of near extinction. Barging and trucking juvenile salmon around the dams has not restored salmon and steelhead runs. Out of the water transport interferes with the physiological changes needed to survive in saltwater, and with adult navigation in returning to spawn. The structural design of the dams causes hydraulic action that creates eddies. The eddies trap migrating juvenile fish, making them easy prey for predators such as pike minnows. Millions of dollars have been spent trying to mitigate this effect, to little avail. Bounties are now paid of $5 to $8 per pike minnow in an attempt to diminish this natural predator that thrives in the slow moving water created by the dams. Just one angler in one year made $81,000 in bounties from fishing out pike minnows in the eddies. The average for the top angler over the last several years is $70,000 in bounty money from fishing out pike minnows. The 16% surplus energy in the Pacific Northwest makes the Snake River dam hydropower unnecessary. If the dams were to be removed, the energy produced by the dams would not need to be replaced. Even if hydropower from the Snake River dams did need to be replaced, it has been replaced more than twice over by wind energy. Wind energy is greener than hydropower, since it does not destroy entire watersheds. At times of high river flows, energy oversupply is a costly problem. For example, pursuant to its Oversupply Management Protocol, in 2012 the Bonneville Power Administration paid $2.7 million to wind energy generators to curtail power production during periods of high spring runoff. Ratepayers ultimately paid for this. The Snake River is a “river of negligible use” per the Army Corps of Engineers’ definition. Ice Harbor Dam is the only one of the four dams that provides irrigation for farms. If the dams are breached, irrigation intake pipes can be extended to the river. In a Biological Opinion, NOAA can tell the Army Corps and other involved federal agencies that breaching is a Reasonable and Prudent Alternative to avoid jeopardy to endangered and threatened species listed under the Endangered Species Act. Presidential executive action is legal, feasible and practical. Congressional authorization is not needed to breach the dams, since they don’t pencil out. It can be done through channel bypass by removing part of the earthen berms adjacent to the concrete structures. Structures can remain in place. The first dam, Lower Granite at Lewiston, Idaho, can be breached during the President’s term. A congressional appropriation to breach the dams is not needed.